Blurb: As Charlotte steps through the gate, she has a strong feeling that nothing will ever be the same again. My thoughts: I really like the redesigned covers of this trilogy and think they help the books stand-out. I found Beckoning Light an enjoyable, fun read. The first book in a trilogy, author Alyssa Rose Ivy really set up the mystery that main character Charlotte decides to figure out--can she open the garden gate in her backyard and if she can, what will she find? The opening scene on the plane with Charlotte (16) and her older brother, Kevin (18), introduced the siblings and their situation to us. With their geologist father moving yet again to another place to work, he decides to send his kids back to their home in Charleston to live with their Uncle Monty who has been living in the house himself for the past three years. Both teens are looking forward to going home to the warmth of South Carolina, far away from the cold climate of Alaska. Besides, since losing their mother five years earlier, they need some stability since Kevin will be graduating high school and going off to college. At home, Charlotte realizes how much she missed it and is drawn to the backyard and her mother's garden, the one with the gate her mother warned her about as a child. As her brother tries to get her to socialize more, clueless to his best friend Liam's feelings for her, the shy Charlotte gives in. There's her classmate, James, another mystery she finds likable at times and others not so much. The moment she uses her mother's key and enters through the gate into another world, she encounters Calvin and discovers her first feelings of love. Since I was expecting a love interest in Liam or James, I liked this twist in events. While I did enjoy watching Charlotte grow as a character from a meek girl who gives in easily to those around her into a young woman with an increasing inner strength, I didn't really connect with her. Kevin shares the narration with her in alternating chapters and I found his voice sounded older at times. Since they had lost their mom I chalked up his maturity to having to grow up fast and needing to take care of his sister. There were some spots where his narration seemed to tell us too much, instead of showing us, and when Charlotte enters the other world I expected more of a reaction out of her. Otherwise, the magic, the fantasy aspect of the story, and its history was intriguing--definitely unique!--and I wanted to find out more about this fantastical new world and Charlotte's role in it (which I will in the next two books). The author's writing flowed easily and kept me reading until the end of this satisfying first installment. I also liked the twists and turns the story took, especially the addition of Calvin. Beckoning Light has the beautiful setting like that of The Secret Garden, combined with a secret world and its magical inhabitants, which will entertain any reader of YA fantasy books. Add this one to your TBR list. Favorite scene: "I walked through the garden quickly and inserted my key into the gate. The gate swung open, and I walked through, closing it behind me. As I tried to let my eyes adjust to the light, I felt a pair of arms come around me. "You came back!" Calvin exclaimed. "Of course." It felt so good to be back in his arms. "I‘ve been standing here for an hour, terrified that you would not come," Calvin admitted. "You said the same time as last time." I suddenly worried that I was late.
" I know, but I did not want you waiting on me. This is not a place for a woman to be wandering alone." Calvin took my hand and led me through the garden, across the open field, and back into the forest we had been in last time. Once under the cover of the trees, he pulled me to him and kissed me again, this time with even more intensity. Once again, I was left breathless, leaning against him for support. "I have missed you so much, Charlotte," he breathed. "It was only two days, and I missed you. The coming months will be hard." "Do you have to go?" I asked. "Yes. I wish it were not so, but if we want any chance to be together, I need to keep my position." I felt a lump in the back of my throat, and my stomach hurt as I thought of not seeing him again, but I refused to ruin the time we had together. "But we have today," I whispered." 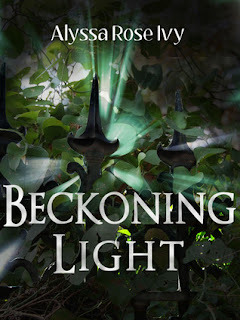 Cover comment: I like the richness of the green leaves and the light pouring out from the gate. Book source: Received this book from the author for my honest review during an Enchanted Book Tours blog tour. 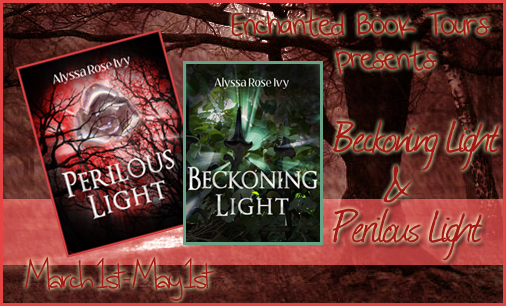 Thanks for reading and reviewing Beckoning Light!